How can we determine dangerous levels of climate change so that we can stay within those limits? WHAT: Working out what the limit to dangerous climate change is and what the implications are for the amount of carbon we need to not burn. This (very) lengthy and detailed paper runs us all through exactly what’s happening with the planet’s climate, what’s making it change so rapidly (spoiler: it’s us) and what objectively we need to do about it. Needless to say, since the lead author is Dr. James Hansen, the godfather of climate science, we would do well to heed his warnings. He knows his stuff; he was doing climate models before I was born (seriously). Firstly, the paper points out that humans are the main cause of climate change and then also neatly points out that while all 170 signatories to the UN Framework on climate change (UNFCCC) have agreed to reduce emissions, so far not only have we not worked out what the limit for ‘dangerous’ climate change is, we’ve also done nothing to fix it except fiddle at the edges. Then, the researchers look at 2oC warming as a target. In reality, while 2oC is a nice, seemingly round number that is far enough away from our current 0.8oC of warming, the reason it was randomly chosen to be our line in the sand is that it’s the point beyond which ecosystems start collapsing. I have a sneaking suspicion it was also easy to agree on because it was way into the ‘distant’ future, but let’s play nice and believe it was all for rational scientific rigour. The latest IPCC report says that if we’re going to stay below 2oC, we can burn a total of 1,000GtC (Gigatonnes of carbon). Ever. This means we need to leave fossil fuels in the ground and stop cutting down more trees than we plant. As has been pointed out in previous papers, the researchers show that burning all the fossil fuels is a really bad idea. A really bad idea in a mass extinction like the dinosaurs kind of way. So, if we look at all the warming that has happened so far and measure the energy imbalance in the atmosphere, what do we get? Firstly a step back – energy imbalance. This is your energy budget where you always want it to be constant. Energy comes into the atmosphere from the sun, some goes back out, some stays and keeps us warm and comfy on planet Earth. Fossil fuels mean that humans have taken a seriously large amount of energy out of the ground and burned it. Releasing this energy into the atmosphere means we’ve now got too much energy inside our atmosphere and we’re out of balance. What happens when we’re out of balance? Well, so far it hasn’t been pretty. With only 0.8oC of global warming 98% of Greenland’s surface melted for the first time in recorded history, Arctic sea ice hit new record lows, the planet has seen more frequent more extreme storms, floods, typhoons, hurricanes, droughts, fires, algal blooms, glacial melt, and ocean acidification. We’ve had weird storms no-one has ever heard of before like Derechos, we’ve had tropical diseases in new places, and the Jet Stream over the Northern Hemisphere getting ‘stuck’ and dumping more weird weather on us. 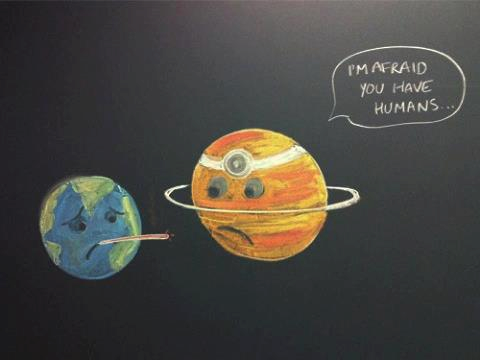 It’s pretty clear the planet is unwell and that it’s because of us. If all that terrifying stuff is happening at 0.8oC of warming, what does that make 2oC? Hopefully your answer is ‘horrifying’, because that’s what my answer is. Since 2050 (when we’ll arrive at 2oC if we keep going business as usual) is within my working lifetime, I’ll let you know how horrifying it is when we get there. More scientific than ‘horrifying’ though, the researchers point out that previous paleoclimate changes, from the Earth’s tilt and other slow oscillations took between 20,000 – 400,000 years to happen. Changes happening at that rate give the plants and animals and fish time to relocate and survive. The rate at which we’re changing our modern climate is bad news for things that are not mobile. How far out of balance are we? The paper estimates that between 2005-2010 the planet was 0.58 W/m2 (± .15W/m2) out of balance. How much of that was caused by humanity? Well, solar irradiance has been going down over the last while, so it’s pretty much all us. If we are 0.5 W/m2 out of balance, the researchers calculate that we would need to reduce the CO2 concentration down to 360ppm to have energy balance again (we’re currently at 395ppm). If you include some error in the calculations and we’re 0.75W/m2 out of balance, humanity needs to get CO2 down to a concentration of 345ppm. To make planning easier, the researchers suggest we just aim to get and stay below 350ppm. The paper then runs through all the reasons why 2oC is a really bad idea to let happen. Because it will lead to damaging sea level rise (sorry Miami), because change is happening too quickly for many species to survive and more than half the species on the planet could go extinct from too much warming (and yes, if we warm this planet enough, humans could be part of that mass extinction). Because the recovery back to normal temperatures happens on a timescale of millions of years which is beyond the comprehension of humanity. So to avoid being the next mass extinction, what do we need to do? First, we need to quantify how quickly fossil fuels need to be totally phased out. If emissions are reduced to zero in 2015, the world could get back to 350ppm by 2100. If we wait until 2035, it would take until 2300. If we wait until 2055, it would take until the year 3000. So when we start reducing emissions is important. If we had started reducing emissions in 2005, it would only have taken reductions of 3.5% per year. Since we didn’t do that, if we start now, we need to reduce emissions by 6% a year. If we delay until 2020 it becomes 15% per year, so let’s not procrastinate on this one humanity. Also keep in mind that the amount that is considered ‘politically possible’ is currently around 2-3% reductions each year, which means that scientific reality and political delusions are going to collide very soon. If we reduce our carbon emissions by 6% per year to keep below 350ppm of carbon dioxide by the end of the century, our total carbon budget is going to be 500GtC. 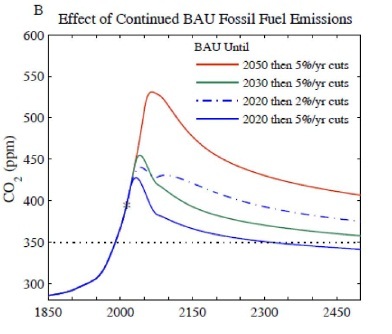 This means we’ve got ~129GtC that we can burn between now and 2050, and another 14GtC left over for 2050-2100. Humanity has already burned through ~370GtC from fossil fuels, so we’ve got to kick this habit quickly. The paper points out that this means all of our remaining fossil fuel budget can be provided for by current conventional fossil fuels. Therefore, we would require the rapid phase-out of coal and leave all unconventional fossil fuels in the ground. Yes, all of them – all the tar sands, the shale gas, the shale oil, the Arctic oil, the methane hydrates, all of it. The researchers also say that slow climate feedbacks need to be incorporated into planning, because we’re probably starting to push those limits. Slow feedbacks include things like melting ice sheets (Greenland and Antarctica), deforestation, melting permafrost and methane hydrates. These things are like climate ‘black swans’ – they’re unquantifiable in that you don’t know when you’ve passed the irreversible tipping point until after you’ve gone beyond it, but things like the ocean no longer being able to absorb most of the carbon we spew into the atmosphere and the rapidly melting permafrost need to be considered in daylight as well as our nightmares now. This is because slow feedbacks can amplify climate changes by 30-50% which puts a big hole in our ‘not burning carbon anymore’ plan. The paper points out: ‘warming of 2oC to at least the Eemian level could cause major dislocations for civilisation’ which I don’t even need to translate from scientist, because scientists are no longer bothering to pull their punches when explaining how quickly we need to stop burning carbon before we’re really screwed. So what do we do? The paper makes some suggestions, pointing out that since the science clearly shows what’s happening, the range of responses is also pretty clear. The first thing is a price on carbon. This paper suggests a carbon ‘fee’ with a border levy for countries that don’t sign up to the fee idea. The fee starts at $15/tonne of carbon and increases by $10/tonne each year. Imports from countries that don’t have the fee get charged at the border, which can then be used for assistance to industries that are exporting to countries without the fee. They point out that this fee is below the price of cleaning up our climate carbon mess. If we wanted to pay to sequester 100ppm of CO2 out of the atmosphere, it would cost ~$500/tonne of carbon. If that was charged to all countries based on their cumulative emissions, that would be a cost of $28 trillion for the USA (or $90,000 per person) who is responsible for 25% of cumulative global emissions. Hmmm – expensive. The other things we need to get rid of fossil fuels are hybrid renewable smart grids and better efficiency as well as not only an end to deforestation but ‘reforestation’ and increasing the amount of trees on the planet. There’s a lot of work to be done, but the clearest thing from this paper is the choice we cannot make is to do nothing. So let’s stop burning carbon. This entry was posted in atmosphere, clean energy, climate change, greenhouse gases, mass extinction and tagged emission reductions, James Hansen by amyhuva. Bookmark the permalink. Haven’t had the chance to follow the article trail back to see how they got the $500/ton number, but that’s ridiculously high. Realistically, capture and storing CCS from point source emitters is between $50 and 70 per ton, which is what’s been cited by the IPCC and McKinsey. If they’re looking at direct capture from ambient air, that’s higher, possibly in the range of $100 to 300 per ton, and even those are only so high because the technologies are so young. As always, fantastic article! $70/tonne seems very cheap to me. I haven’t read any papers that estimate CCS for less than $150-$200/tonne. I’d be interested to read that report- I wasn’t aware of any new technology breakthroughs. The paper stated that it would be the cost of CCS that was for air capture of 100ppm of CO2 hence the very high cost comparable to source-based CCS. That’s a huge spread! I thought it was interesting that the CCS institute was so dismissive of solar and wind. I understand that their mandate is to promote CCS, which is definitely part of the solutions for climate change but that’s going to be in conjunction with hybrid renewable grids and improved storage and efficiency. and I think the improvements in battery and storage capacity will continue. Combine that with the increased resilience that comes from a distributed rather than a centralized grid, and I think we’ve got a recipe for keeping more lights on the next time a big storm hits. Distributed grids are definitely going to gain popularity, if only for their versatility/resilience. I know that after Hurricane Sandy, that was one of the big discussions that came up. I don’t think it’s likely to be an either/or question though. The fact is, geography/geopolitics has had and I think will have a big role to play. Denmark, for example, has near perfect conditions for implementation of offshore wind. Alberta and Norway just don’t have the reason/motivation to transition to wind and solar in the near future, but CCS isn’t an unrealistic sell. As far as mandates, it is a little unfortunate that the focus is on individual solutions rather than combinations, but that I think is just a reflection on how unnecessarily competitive research/politics tends to get.